Here is a really indulgent little recipe for a comfort food I love to prepare in the winter. Rice, spinach, peas in home made (by Mum), Kolhapuri masala, drenched in fresh cream and ghee!! Yumm!! Heat oil in a pan. Add the peppercorns, cumin, cloves, cardamom, and bay leaf. Drain the soy nuggets. Squeeze out any excess water using your palms. Add the soy nuggets and fry on a medium for 5 minutes, or until they being to turn brown. Next add the peas, green chili, spinach, turmeric, and salt. Cover and cook for around five minutes. Drain the water from the soaked rice and add it to the vegetable mix. Pour in a cup and a half of the home made vegetable stock and the kolhaouri masala. Bring the rice to a simmer. Turn down the heat, cover and cook for 20-25 minutes or until the water is absorbed and the rice is almost ready. Now stir in the fresh cream and ghee. Keep the tehri covered for another 10 minutes. The great thing about this rice dish is that it is so incredibly delicious and flavourful on its own, you need no side dish or pickle with it. Its a one pot meal - just serve hot with plain yogurt!! could use this to get thru the terrible weather patch here. adding kolhapuri masala is a nice touch! Thats a great looking and yummy rice, feel like having some..
healthy and comforting....a yum one pot meal! Healthy and delicious meal, love soya in cooking. Back after a long time..happy new year! !looks so delicious..yummy recipe.. 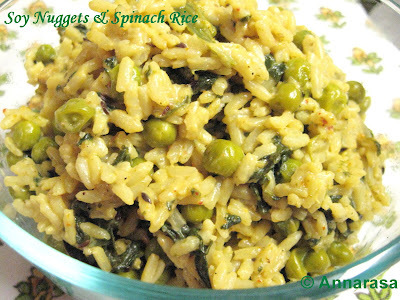 This is very nice, I love rice and spinach!